Women value their college degrees more than men, according to a recent Pew study. 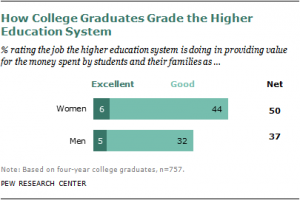 A Pew survey found women see more value in their college educations than men. 50% of women rated their college educations as either “Good” or “Excellent” in terms of value for money, compared to only 37% of men. Interestingly, however, women were more likely than men to question the cost of a college education. Only 14% of women surveyed felt most people could afford to pay for a university education, as opposed to 28% of men. The results were based on a telephone survey of over 2,000 adults living in the United States. Only 757 respondents had a four-year college degree or some other higher education, a percentage consistent with American demographics. Public reactions to the changing gender patterns in higher education are mixed. By a ratio of 52% to 7%, Americans say the fact that more women than men are graduating from college is a good thing, rather than a bad thing, for society. However, when presented with the flip side of the story, the public’s enthusiasm disappears. Some 46% of Americans say the fact that fewer men than women are graduating from college is a bad thing, while just 12% say it is a good thing.